Achieving the capability to foil requires the boat to be as light as possible. Achieving the lighter weight drives many decisions in our design and construction process. The shape, efficiency, and reliability of the foils are critical to giving the Eagle Class the ability to lift out of the water, especially at extremely low wind speeds. EC 53 is capable of reaching between 25-35 knots in light wind. An automated rudder T-foil control system is included to maintain level trim of the platform in the C-foil configuration. Speed without control is dangerous. To increase the safety and reliability, we are using cutting-edge technology to create a rudder T-foil control system that increases stability and righting moment at high speeds. The spacious and airy cabins in each hull have a full 6 feet 5-inch headroom. The five windows combined with a large hatch above each bunk give fantastic natural light and ventilation. Each cabin includes a Barcelona-style chair for lounging, a generous closet and a full length double bed at 6ft 5inches. The wet room / heads have enough room for two people with specialized features such as a custom carbon sink and lightweight Techma head. All interior components are ergonomically designed using modern and lightweight materials. The main saloon features a teak cabin sole with a central entertainment island unit. This bar contains a sink, refrigerator and additional storage and can be customized to include an ice-maker and microwave. The island is flanked by bar stools and two leather settees. The 53T is a turbo-charged version of the Eagle Class. 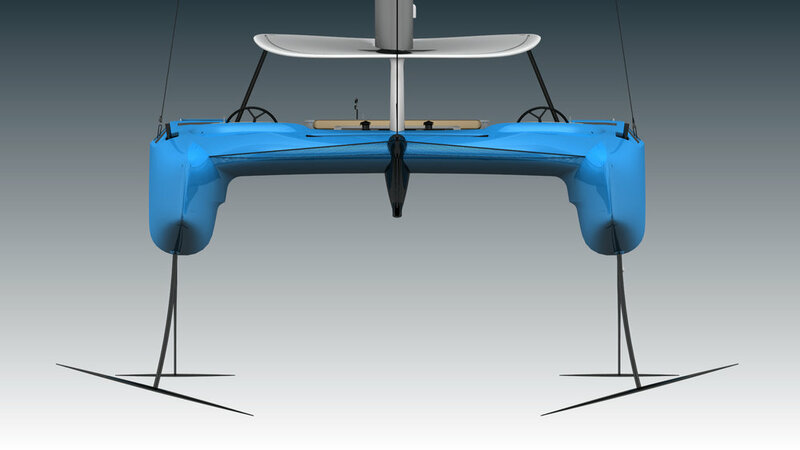 Standard C foils are replaced with carbon fiber T foils creating a platform which foils at very low wind speeds and significantly increases the speed potential of the boat in medium to heavy wind conditions. The 53T also comes equipped with our fully automated foiling control system.